'There ain't no #LoveinLiteraryAfrica apparently ... ' is the tweet from Grace A. Musila - Senior Lecturer at Stellenbosch University - that started it all. That was Wednesday February 10th. The New York Times had published a quiz five days earlier - 'A Valentine's Day's Reading List', where readers were meant to match the ' ... character with his or her beloved, and name the literary work in which they appear.' On that same day (Wednesday), I was at work trying to finish yet another report. 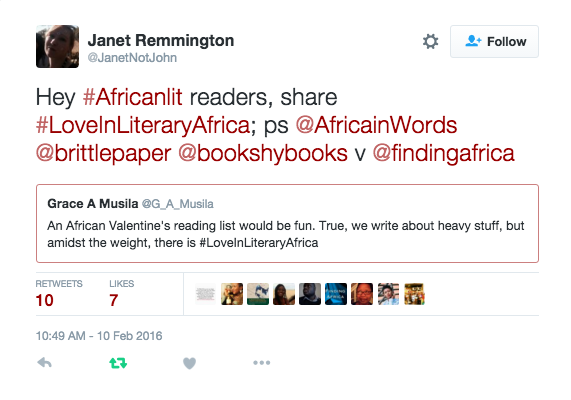 The day came to an end and completely dreading the cold journey home, I check my phone and noticed a tweet from Janet Remmington (@JanetNotJohn) about #LoveinLiteraryAfrica. I check it out, and going through my TL, reading the different tweets, I was instantly warmed. Well, African Twitterati was definitely 'Lit' thanks to the AfLit Vuvuzelites. Simply put, Musila's initial tweet was 'a protest against this oh-so-familiar tradition'. 'We thought it would fun to fill in the gaps in that list, so to speak, and remind ourselves that there is an exciting range of literary portrayals of love in Africa; writing that was as interesting and insightful as the list featured in that article. #LoveinLiteraryAfrica quickly transformed into a delightful celebration of literary imaginings of lover by and about Africans. 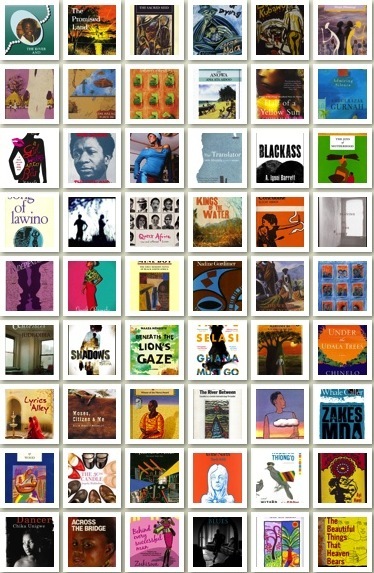 It became a way of sharing our personal favourites from the vast library of African literature, and giving each other pointers on what is available, by and about Africans. And that was the pleasure of it: sharing recommended tittles and seeing a virtual community of lovers of African writing speaking to each other'. In deed we are (full of love stories). Going through #LoveinLiteraryAfrica, I counted over 90 works of fiction - excluding poetry and academic texts and links to online stories. Yes, you read correctly, #LoveinLiteraryAfrica is an amazing literary resource with over 90 works of African literature which draw on the theme of love in its many guises - the bittersweet love affair between Tayo and Vanessa in In Dependence, Rapu (the maid) hooking up with the Oga (a Madam's worse nightmare) in The Night Dancer, the dynamics between Furo and his new love, Syreeta, in Blackass. 'The notion that African literature is not, or should not be, about private lives or private emotions is not new. As far back as 1991, Ama Ata Aidoo said wryly (in the preface to her brilliant novel about lover in Ghana, "Changes") that she was about to go back on her earlier vow never to write about lovers in Accra. Supposedly, African literature had other, larger issues - to do with the political struggles of a continent - to worry about. But Aidoo is a thoughtful and subtle writer who knew that there is no firm dividing the line between the private and the political. So what does #LoveinLiteraryAfrica mean for Primorac? This leads me to ask, what is your #LoveinLiteraryAfrica read? 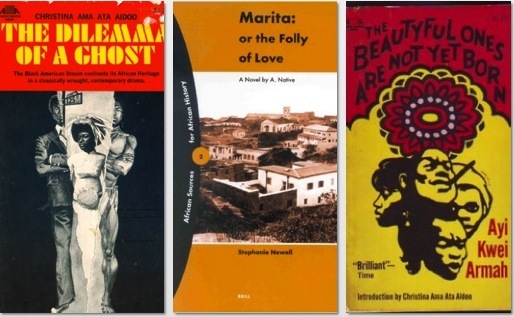 Join the conversation, share your #LoveinLiteraryAfrica reads - it can be fiction, poetry, academic works, works online, anything - and read these #LoveinLiteraryAfrica reads. PS. I've put together a Storify (my first ever!!!) 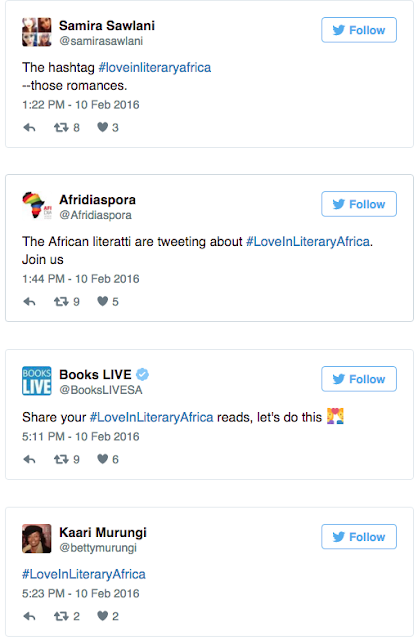 of #LoveinLiteraryAfrica capturing the main themes so check out.